“We’re their food and we’re running out.” The world is overrun by billions of vampires. Humans are nearly extinct. Those who have survive stay on the move, resting by day and running by night. They track us by our scent. One group of survivors found banded together try holding up in a fallout shelter that masks their scent. These vampires drive, they shoot and they have more than one way to track their prey. The human's underground hideout has just become their underground prison. Actor Jeff Sinasac writes, directs and stars in a low budget, post-apocalyptic zombie-esque world where vampires outnumber humans. A rough start with some budgeted CGI leads into a movie whose production values otherwise look well beyond their means. Simple farm settings like in the Walking Dead are smartly used to tell a small story of one group of survivors. Sinasac and Elysia White bare all and mask themselves with mud in this alternative take on vampires. This dialogue driven drama is an action movie with a horror setting. 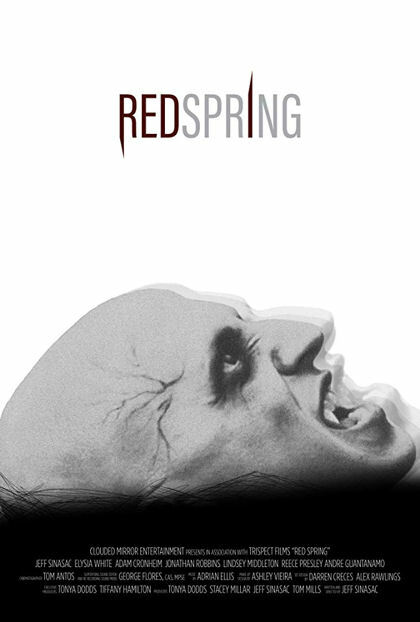 Red Spring borrows from on the run vampire flicks before them like John Carpenter’s Vampires and Near Dark and zombie survival films like Romero’s Dawn of the Dead and The Walking Dead adding their own variation on a new spun vampire tale. Impressive for a lower budget movie, Sinasac breaks some new ground and most importantly entertains.